Mark is the founder of Rivervend Steamboat Company, whose mission is to locate various styles of passenger vessels and create new uses for them, including condominium residences, hotels, entertainment centers and worldwide retirement cruising. He is given credit for basically inventing the idea of affordable condominium cruise ships and within one year of creating Condo Cruise Lines in 2006, had amassed deposits for over $52 million in condo sales for its first ship. 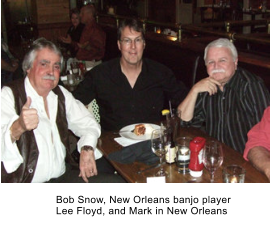 In the 1960s Mark toured with a rock and roll band playing drums behind both Del Shannon and Tony Orlando. 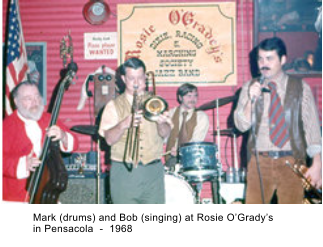 He later played with Bob Snow in his Rosie O’Grady’s Dixieland jazz band in Pensacola’s historic Seville Quarter. During the 1970s, Mark perfected the art of old-time souvenir costume photography and created a chain of a dozen locations throughout the south called Jeremiah Goodstreet’s Old Time Portrait Parlors. He even taught Walt Disney World in Orlando the process. As a special event producer, Mark created record-breaking themed trade shows around the country and produced the spectacular Atlanta International Air Show & Balloon Festival in that city in the early 1990s, and a Ray Charles concert in Pensacola. Mark has worked with Bob Snow off and on over a span of 45 years at his different entertainment projects.